A massive oil spill in North Dakota went unreported to the American people for more than a week due to the Federal government shutdown. We are talking one of the biggest U.S. spills of recent years. Remember the Exxon Mobil pipeline leak in Mayflower, Arkansas? 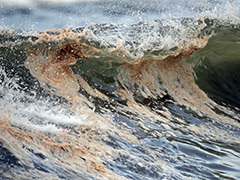 That spill was around 5,000 to 7,000 barrels of oil—small potatoes compared to this incident. More than 20,000 barrels of crude oil were spilled from a leak in a Tesoro Logistics LP pipeline, according to an article by Todd Melby and SelamGebrekidan for Reuters. The spill has not affected the underground water supply, but the same cannot be said for one farmer’s crops. Steven Jensen was out harvesting his wheat crops on September 29 when he discovered oil pooling. "It was pretty ugly," he said. The nearby crop had "disintegrated, you wouldn't have known it was a wheat plant." Jensen reported the incident and an emergency response team was at the site the next day, working to isolate the spill. Under normal circumstances, the National Response Center would have taken quicker action to report this. The National Response Center is an organization staffed by Coast Guard personnel that receives reports about hazardous spills and then communicates that information to emergency response leaders. The National Response Center should have reported this spill on its website within 24 hours of being filed. However, the government shutdown has delayed this process, and the report was not posted until October 8. This makes one wonder, what else are we not hearing about? We rely on government agencies to protect us and provide us information. If most of their employees are furloughed, can we expect them to respond as well as they would have if the shutdown was not in place? In a crisis situation, we’d rather not have to wonder. Posted on October 17th under Pollution Reduction.